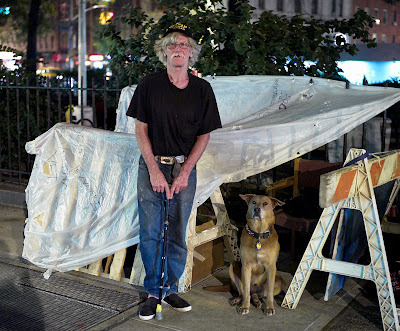 With all the buildings being built all around Jim and Jesse Jane it is , when you let yourself really think about it , a bit incomprehensible that Jim and Jesse and a lot of others still have to live on the sidewalk under a tarp in New York City . 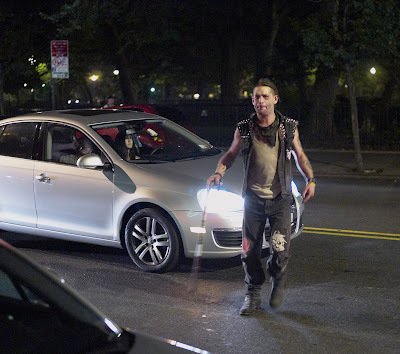 Wednesday Jewels , our Tompkins Square Park "Jekyll and Hyde" , after 4 good sober days , drank a notable quantity of his prefered alcoholic potion launching again a demon on another day of rage and rampage in the neighborhood. Jewels started drinking early and drank often today . 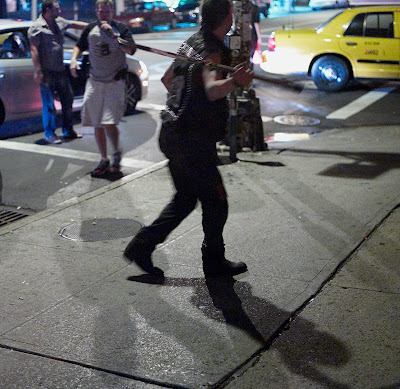 His rampage began on avenue A the usual way . 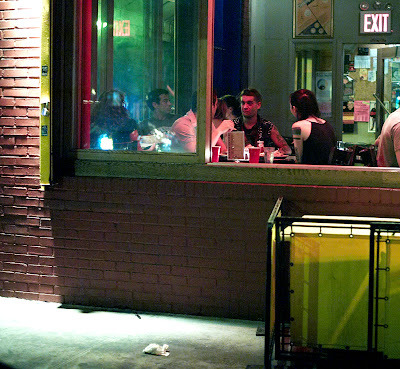 Jewels played in traffic stopping cars and entered restaurants to shake-down patrons and owners alike . According to witnesses , police were called early in the day by one restaurant with a large number of officers arriving at the scene . As usual no arrest was made . 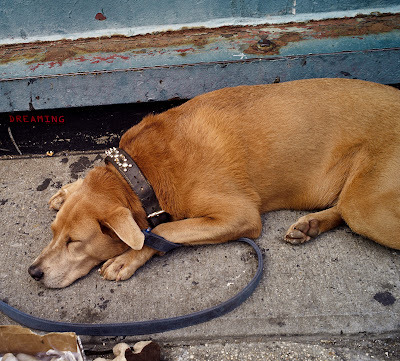 Much of the rest of the day he just drank and raised hell becoming by evening quite drunk and exhausted . 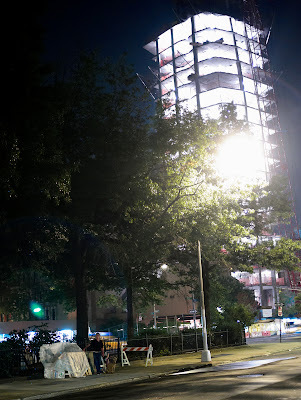 Above a park regular is helping a very shakey and uncertain Jewels walk out of TSP and across the street to the farside of avenue A where he will now after some rest continue his drunken rampage . 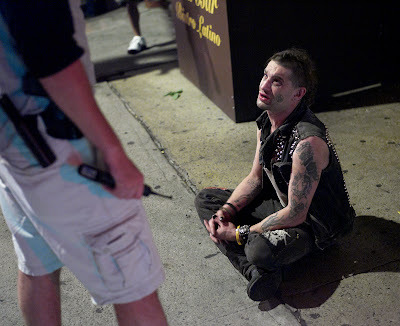 Jewels accosts a pair and makes an unsucessful demand for $ 2 .... but he does get a cigarette . Jewels joins a party of diners at 7A Cafe to again demand money without success . 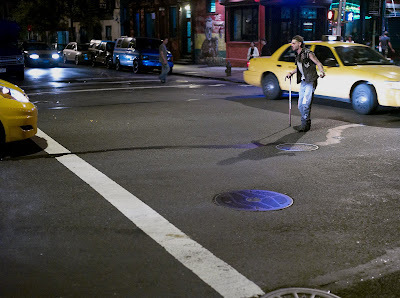 Jewls blocks the intersection stopping cars demanding money from drivers . 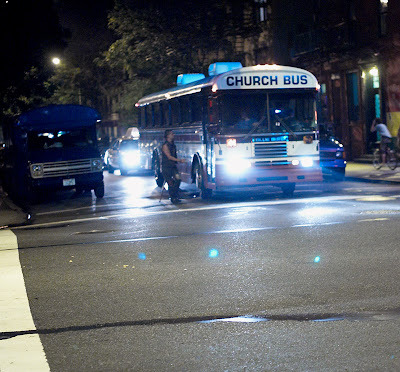 As it prepares to round a corner a church bus is confronted with a demand for money . 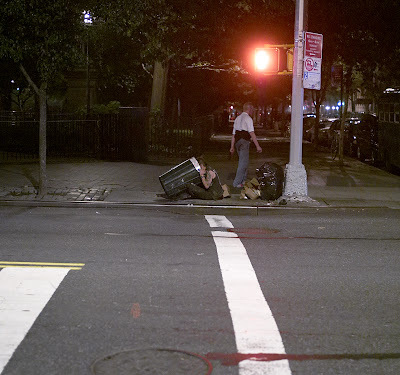 A public garbage receptacle is searched for scraps . This car Jewels caused to back-up 150 ft. 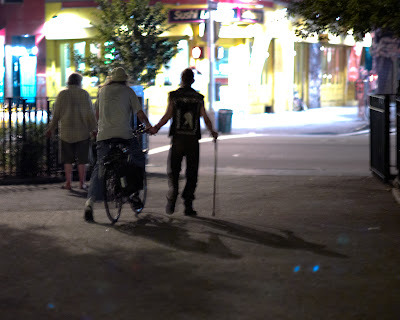 This action is unproductive and Jewels heads back to the sidewalk to prey on individual pedestrians to raise money for booze . Unkown to Jewels the occupants of this car have called the police . They will also press charges against Jewels . 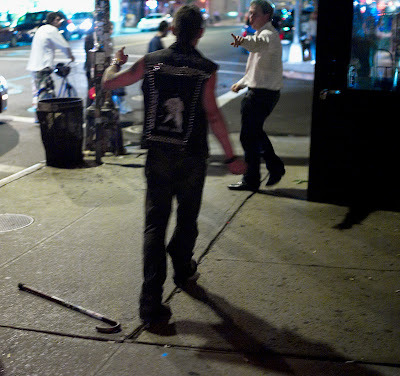 Jewels accosts this man and when he does not give Jewels the money that he demands , Jewels attacks him at first swinging and then dropping his cane . 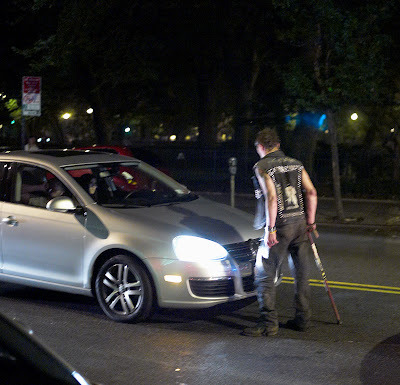 Jewels picks up his cane and swings it again in a rage but then as police arrive he surrenders , sitting down on the sidewalk as instructed to do . Jewels is questioned and cuffed. Jewels is escorted to a waiting police vehicle and taken away . 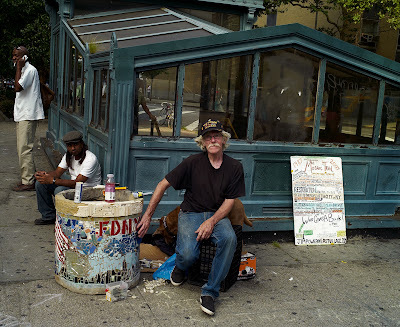 Jim and Jesse Jane were in Astor Place today . 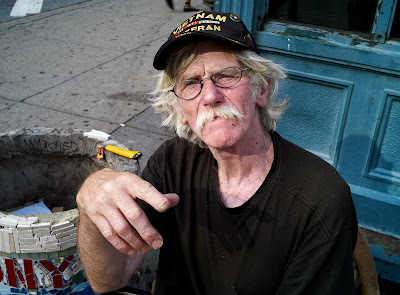 Jim , the one and only true "Mosaic Man" , was working on the planter that he started last summer when he was living on the sidewalk in front of 120 St. Marks Place . 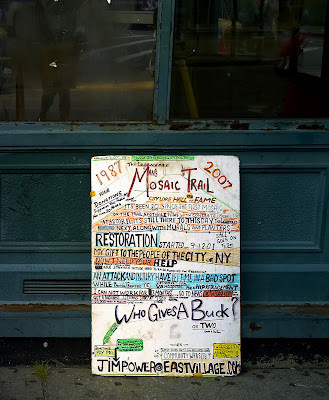 Somehow Jim was able to move his massive mosaic art work to a prominent location near the subway entrance at this major East Village crossroads . 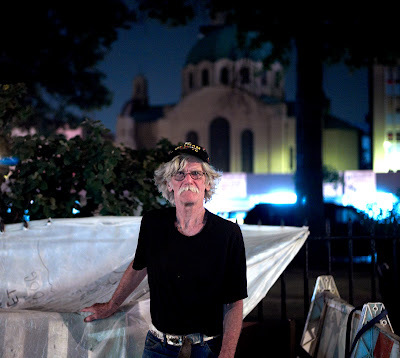 It seems that we are all back where we were last summer when NMNL began : Jim and Jesse Jane are again homeless and sleeping on a sidewalk in the neighborhood .